Multi Best in Show, Best in Specialty Show, and Group Wins! Obedience Titles, Show Champions, and a dash of Field Work too! Highcaliber and Labradale Kennels welcome you to our website. 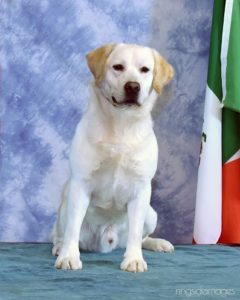 Labrador Retriever breeders for over 40 years, Labradale Kennels, owned by Ross and Liane Brennan, has had great success and is recognized internationally for their exceptional Labs. Highcaliber Kennels, owned by Sharon Luckhart, has achieved the highest honours in field, show, and obedience, and offers over thirty years of Labrador lineage. Offering over 100 years of combined experience and located 45 minutes from Montreal, we offer purebred Labrador retrievers of outstanding quality. Our website is here to introduce you to our wonderful family of Labrador Retrievers. All are CKC Registered and parents (including past generations) of our puppies have certified hips, elbows, eyes and more behind them. We are very proud of the Labrador pedigrees, as well as all the achievements that our dogs have accomplished over the years. From Best in Show and Specialty Show (Labrador only competition) wins, to field and performance titles, to service dogs for MIRA, to gracing the cover of some of the most respected dog magazines in North America… but most of all the happiness they bring as wonderful companions to our clients and their families. Puppies are available upon occasion. We recommend reservations. Our success lies in the diligence, respect and care for the breed. We remain focused on the both selecting dog’s meeting the standard while never forgetting the Labrador’s train-ability, loyalty and unique drive that makes them one of the most versatile breeds as a working dog, service dog and of course, exceptional family companions. ensuring clean and comfortable living conditions for our Labradors. Sound body and spirit is our priority! We remain devoted to this wonderful breed and continue to strive to maintain our goal to produce sound, quality loving family companions that meet the Labrador standard. All breeding stock is certified clear for hip and elbow dysplasia. We also utilize modern science, completing genetic testing to ensure that our puppies cannot be affected by Exercise Induced Collapse (EIC), Progressive Retinal Atrophy (PRA-prcd), Centronuclear Myopathy (CNM) and Hereditary Nasal Parakeratosis (HNPK). Not only this, but we have proven our lines within conformation, obedience, and field work. We hope you enjoy the site, and please contact us if you have any questions or would like to make an appointment to visit our special Labradors. 2019 is underway and we have some exciting news to start off the year! We have added four new boys to our stud dog lineup. This includes, Nitro and Dragon who have each been awarded wins at their first shows to start off the year. Not yet posted under our boys they will join the lineup shortly. Check back mid-April. Informal picture of Nitro below. Expresso and Mimi are expecting our first litter of 2019 in early March. Black and chocolates expected. Watch for us this year, will be limited showing and trialing but definitely planning an action packed year! Introducing Labradale’s Big Bang at Highcaliber, aka Nitro. A nephew of our Blake his dam is Am Ch/Can GCh Britton Highcaliber Cami. Located 45 minutes from Montreal, Quebec and ten minutes from the U.S. Border. amazing health, shape, and coat.